The Internet is a global network, connecting many smaller individual networks. For example, the computer you are using now is connected to another computer on campus. All the departments on campus are then connected to a larger network in the state. The Minnesota network is connected to regional, national and international networks. The Web, short for World Wide Web, is just one part of the Internet. Search engines are handy tools that help you find what you want on the Web. Each search engine uses software (called spiders or robots) to compile a database of pages found on the publicly accessible Web. When you enter a search, the search engine scans its own database to match your terms against terms in the pages of its database. Google, Bing, Yahoo, and Ask are examples of popular search engines. Can I Use the Web for My Research? "My instructor says I can't use Web sources for my paper." Ask your instructor to clarify this, because there are basically 'two Webs.' There is the "public Web" that search engines find, and there's the "invisible Web", Web sources the library buys that only the IHCC community can use. An article you find using an online article database such as Academic Search Premier also exists in a journal in print. It's just delivered via the Web by the library to facilitate research. Academic Search Premier is an example of the "invisible Web" that your instructor is probably ok with. Chances are that your instructor is concerned that you might get all your sources from the public Web. See below for some strengths and weaknesses of the public Web. Just about everyone! Large corporations, small businesses, religious organizations, educational institutions, doctors, hospitals, dentists, non-profit organizations, television stations, news organizations, etc. - and maybe even you! Just like any other search, there are tips and tricks to help you make sense of it all. Example: "world health organization" or use quotes when searching a specific person "beyonce knowles"
You can also limit by for-profit sites such as .com, .biz, .tv or non-profit (.org or .net). So, now you have some websites on your topic but how do you evaluate them for content, bias, authority, accuracy, and currency? Here's a website evaluation tip sheet that you can bookmark on your computer or print a PDF. Watch the video below for more tips and use the PDF tip sheet for help. If you ever have any questions about a site, ask a librarian or your instructor. From the Oklahoma City Community College Library. Did your mother call you to tell you that liberals hate science? Did your Facebook feed pop up with an article on a new pesticide that's going to kill us all? Did one of your friends breathlessly tell you that president-elect Donald Trump was going to pardon mass shooter Dylann Roof? You might have heard any or all of these stories, but there's one thread connecting all of them: they're not true. The ability to tell accurate news from fake news is an important skill that you'll use for the rest of your life. Created by the librarians at Indiana University East, the following links will give you valuable insight in telling fact from fiction online, plus a chance to exercise your newfound skills. "What makes a news source good?" 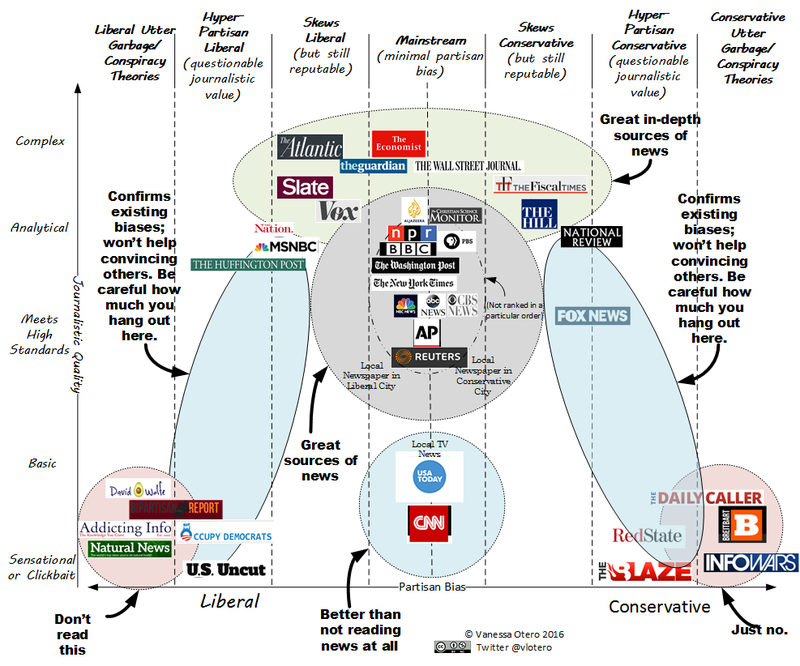 created by Vanessa Otero, this is a graphic of news sources and how they rank in credibility . Click on the link below for a Word document with web evaluation exercises. Print or save the document to your computer. Complete the exercises and bring or email it to the librarians at library@inverhills.edu for feedback. And finally, what's really happening when you search the web? Please continue to Module 6 Citing Your Sources.